It is common practice for reliable software vendors who care about the development of their products to update and improve them regularly. 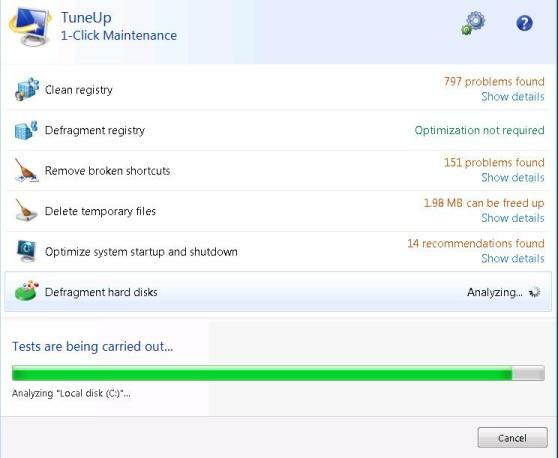 This is the case with TuneUp Utilities, the popular PC optimization tool from TuneUp Corporation. First of all, the new TuneUp Utilities 2011 version has been set up to make its use much easier and much more effective than ever. With this package, the optimizations for all of your PC functions will make your Windows computer run like it used to run on the very first day. One innovation of this program (among other things) that really caught my eye is its feature called “Program Deactivator”. With this mechanism you can “deactivate” programs installed on your system without uninstalling them. This means that programs that you rarely use can be deactivated temporarily, which means increased performance for your system. If you need them in the future, just click one button to activate them again. Please keep reading this TuneUp Utilities review for more information and features description of this computer maintenance tool together with some actual testimonials from other users. This software is categorized as PC Maintenance and Optimization tool although it can also perform backup and data copy functions as well. Its main focus is to keep your Windows computer in top shape by performing several optimizations in various areas on your system. The promise of the product is to keep your PC running like new and to have it working on its optimal performance level. Indeed, the major problem faced by millions of computer users is that their machine starts “crawling” instead of “sprinting” after a few months of usage. Moreover, problems and crashes start occurring all of a sudden without knowing the reason. Well, TuneUp Utilities will do its best to avoid all these issues for your system and to keep it fresh all of the time. Works with Windows XP (service pack 2 and higher), Windows Vista and Windows 7 (all 32-bit and 64-bit versions supported). License works for up to 3 PCs. Disables programs temporarily without uninstalling them. System load will drop considerably from unused programs. Points out software that hogs up memory and removes them if not needed at all. Disables startup programs to increase boot up speed and improve performance and memory. Cleans and defragments the registry. Accelerates system startup and shutdown. Defragments the hard disk to reduce program loading times and allow games to run more smoothly. Cleans hard disk to free up extra space. Deletes sensitive data securely so that it can not be recovered ever. Analyzes memory usage and optimizes memory. Checks hard disks for errors. Restores deleted files in cases of accidental deletion. I have installed the software on my Windows Vista machine and I run the 1-click Maintenance feature which scans, fixes, and optimizes your system with a single click. Below is the screenshot of what the tool found on my system. As you will see, there were 797 problems found in my registry, 151 problems related with broken shortcuts, and 14 recommendations for improving system startup and shutdown. All those problems were slowing down my PC’s performance and I could never be able to fix them without the help of a PC maintenance tool like TuneUp Utilities. Keep in mind that the 1-click Maintenance utility finds and fixes the most important issues. There are many more optimizations and maintenance tasks that can be carried out with this software in addition to the 1-click feature. The company behind this software product is TuneUp Corporation based in Miami Florida. The mother company is TuneUp Software GmbH, a German corporation which is the leader in providing intelligent software tools. As you can see, this software is backed up by American and European corporations which means the reliability and trust for the product is guaranteed. I have done quite bit of research for the product to see what others’ opinions are. The most trusted software reviewing website (CNET.COM) has awarded TuneUp Utilities 2011 full 5/5 stars. Moreover, from more than 1200 votes from users at CNET, they give this tool a rating of 4/5 which is excellent for a software tool (you will NEVER find a software tool with more than 4/5 rating from user’s votes). Pros: It makes it easy to find and disable unnecessary and nuisance start-up programs. It appears to have all the tools to keep my Windows 7 x64 running smoothly and starting quickly. Cons: It often gives an alert signal, and then after I open it, says there is no problem. So why all the alerts? Summary: The best of many programs I have tried to keep my computers running smoothly. The interface is clear and easy to understand. I recommend it to anybody running Windows 7 or Vista. The well-rounded feature set and flexible interface in TuneUp Utilities make it one of the best PC system utilities around. You barely have to lift a finger in this PC system utilities application to keep your computer optimized with unique features like Live Optimization, Turbo Mode and Automatic Maintenance. Plus, you can take advantage of TuneUp Program Deactivator, a feature that’s one of the best at indicating which applications are taking up the most memory. On this website, tech21century.com, you will find only reviews of software programs that are worth reviewing for my visitors. TuneUp Utilities is one of those tools that I’m happy to give it two-thumbs-up. Especially the new 2011 version of the tool, it will be a life saver for your Windows computer system. The promise of the company to keep your PC in top shape really holds true.